This volume is in black and white starting with Jake playing ‘Never have I ever…’ with Finn. Then NEPTR has his turn, making it a bit weird with his subject-choice. Then Finn calls Flame Princess over in a special way so she can join their game. Finn’s next turn brings out how little F.P. knows of a place called Carnival Kingdom, surprising the boys. Jake almost ruins the atmosphere with an insensitive question about F.P.’s childhood, but they turn it around with talks of cotton candy, going off to Carnival Kingdom. When they arrive, Finn gives F.P. a choice as to what prize she’d like him to win and she gets all goo-goo-eyed over a cute stuffed animal. Finn then proceeds to annihilate the game, before the game-keeper even has time to finish his line of questioning. Finn is all set in valiantly giving her his winnings when she is so taken with the game, she ignores him and tries it herself, failing immediately, she then goes flame-y after being sweet-talked by the attendant, Finn and Jake watching on, a bit embarrassed by her display of anger, but Finn also reverting back to his undying awe and anime-style serious liking of her. During Finn’s explaining her awesome side, she calms down and is distracted by another area involving someone playing a fire flute. Then F.P. fakes Finn into believing he’s about to get a smooch when in fact she’s getting ready to tell him of the free fortune-telling. Then there’s a bit of questionable grammar said by F.P. (not sure if it was a joke or not) and she goes in for a reading. At first the fortune is bright, but then it takes a turn, whilst Finn waits with happiness at being referred to by the teller as F.P.’s boyfriend, then he gets grabbed without the princess noticing until the fortune-teller is leaving and she sees his form stuck to the back of his pack. Jake isn’t sweating it, at first thinking Finn will bust out, but then Jake and F.P. track Finn to a forest with trees filled with peeps in bubbles looking like baubles on a Christmas tree, upon realizing Finn wasn’t going to get out of this one without some help. F.P. angrily calls out the dragon who masquerades as fortune-teller and blasts Finn loose from the tree he’s hanging from. Jake marvels at Finn’s diminished size and F.P. seems like she’s going to get personal, but Finn cuts her off and spurns her affection without a thought. Then Jake asks if they should go save the other tree baubled peeps and Finn declines without feeling, which begins to tip them off. F.P. decides they must return and get the real, awesome Finn back. Jake is kewl with little Finn, but F.P. describes all the great qualities Finn has including one which mystifies her. 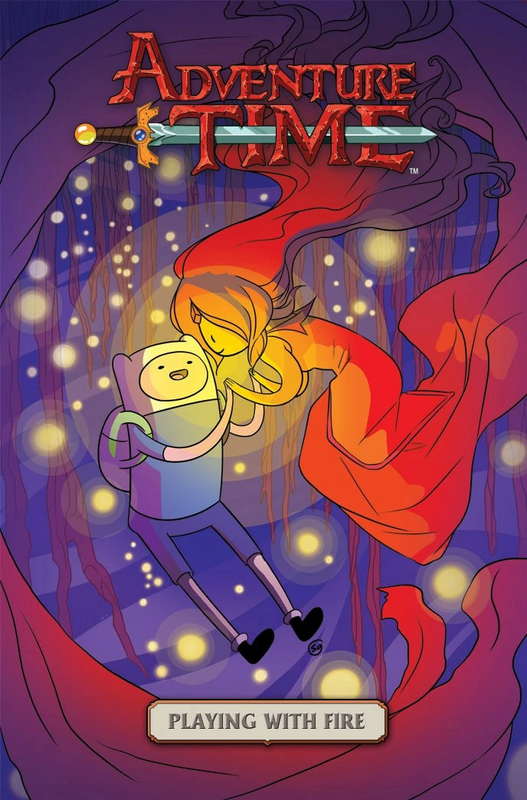 Jake’s about to follow her, but tries one last time to see if little Finn wants to save his soul and confirms his insouciance, so Jake plops him in a skin pocket and is off to catch up to Flame Princess. Jake discovers her puzzling over some game pieces and trying to figure out what she’s to do. Jake finally figures out what the game they must play is all about with obvious rules. Jake isn’t as good at playing at first, though and F.P. is getting impatient. Jake tries to reason with her, but F.P. figures another way through to the next area whether it’s cheating or not, which Jake decides is the former option. She continues on her “rampage” going through the puzzle cave in a way which is suited to her nature, until she reaches a water area they must get through. Jake tells her she should stay in the cave whilst he and Finn explore the underwater area, she not liking this idea and deciding she’ll do what she wants and follows them down into the water, which doesn’t do her much good so Jake catches her before she drifts off. When Jake resurfaces he, distressed to F.P.’s condition of possibly being dead, which still doesn’t affect Finn at all, he then realizes how terrible little Finn actually is, but F.P. does wake eventually, in a bed, with her father coming in soon after she wakes. F.P., through conversation with her father then wonders how she even got back to Fire Kingdom, her father explaining she willed herself back, something she didn’t know she could do. Her father then tries to explain how F.P. should try to give in to her evil side more than any other trait she may have and then gets distracted by his servants and through his conduct towards them, F.P. decides she doesn’t truly want to be there, then waking again on a shore side. After a bit of frustration by the water being everywhere, F.P. happens upon a hollowed castle looking bucket and begins making an enormous castle, but rain soon stops her after she’s struck how little time it took to get the castle so large, then locating a wooden opening above her head. She gets helped through by Choose Goose, who is burned with his efforts, but soon tells F.P. how he got there and his mission in getting his pack back from the dragon. After F.P. exposes how the rooms being puzzles worked, Choose Goose shows her all he’d found was a key, which F.P. is able to figure out must go to one of the doors which is hidden by the dark, which she’s of course able to uncover. Choose Goose suggests she flame up the place, but F.P. goes with the patient way and starts trying doors. Soon she uncovers the right door in an unapparent place, going through with difficulty and landing in a strange place, the door disappearing before her eyes. Soon she’s despairing over how she’ll ever locate Finn in such a vast place, but after shouting his name, she hears hers in return and is led by it, luckily. We have an ethereal moment with Finn’s spirit when F.P. somehow releases him from his little pod. We then get a sign the dragon had been watching close by the whole time, touched by their little display. After the dragon explains why he’d done what he did, he told them his debt to her and can grant one wish, she bursting with something trivial mentioned at the beginning, but Finn reminds her of how they should help the trapped souls, he included. So, in agreement they choose the wish which everyone is uncomfortably put back in their bodies. Finn gets a kiss from F.P. which doesn’t hurt him and is impressed by her control, however recently practiced it may be. They are then all given prizes by the dragon since he’d been planning on releasing everyone anyways also unloading his burden of them onto the trio in returning them to their homes; they do it, though and end the last return with a camp-out. Finn compliments F.P. on her heroic ways and after the boys are sleeping, she’s still thinking of how unheroic she feels, she then sees her father who tells her she shouldn’t be bothered feeling this way anyways and being evil will get her everything and anything she wants, her form changing in the water. Finn and Jake are then awakened by screams from someone in their town caused by a fire. Finn tries to invite F.P. along, but she plays unconscious and the duo run off to help, with F.P. trying to optimistically believe perhaps she could be a hero in the future, ending the story. I wasn’t impressed at first, also I truly get bored with black and white, but the style was Adventure Time and it was a catching story once I began following it more closely; all in all, a good addition. Then we get a story with BMO beginning with him being left a note not to touch the wall of weapons, but BMO can’t resist a brush mohawked helmet, soon revising the note and adding some sword action to his game-play, but gets the sword stuck and falls trying to release it, falling into Finn’s underwear and at first being surprised, then using them, sumo-wrestler-style in a fight with a worm. BMO doesn’t win this fight though and walks off looking for items to build a kite, making a big ka-boom which one sees shake the whole tree-house. BMO test drives his flying implement with himself attached to it, like a hang-glider. Then notices the worm on the ground, worryingly close to where his kite is attached; and rightly so; BMO goes with the wind into we know not where, being called and seen looking like a felled warrior when someone opens the door to his knocking. A cute one, not a bad way to end the volume.